In the foothills of the Sierra Nevada Mountains in Southern Spain, overlooking a river, stands a special place of heart felt connection with nature. Peace and tranquility abound. The only sounds birdsong and running water. 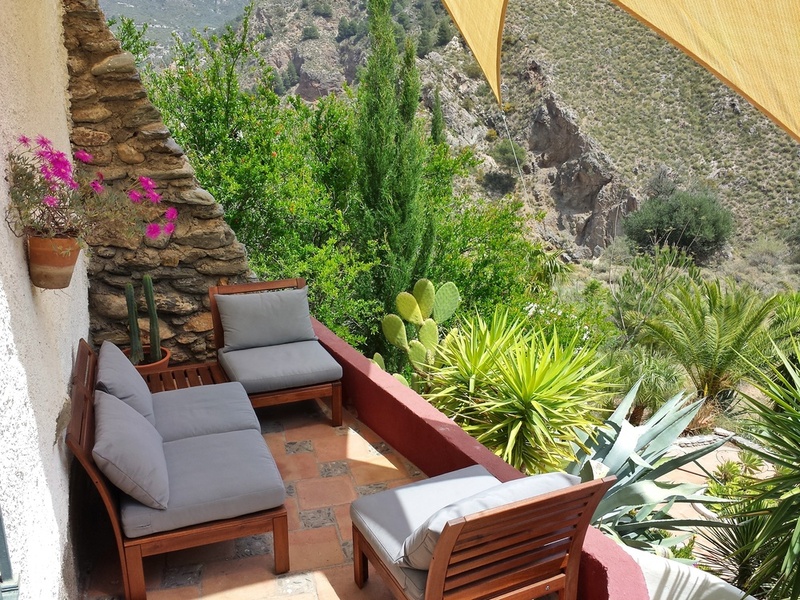 Although immersed in nature the house is not remote, being just 15 mins from the lively market town of Orgiva, 35 mins from the Costa Tropica and the Mediterranean Sea with it's tropical micro climate and 1 hour to the beautiful city of Granada and the historic Alhambra Palace. The Airport at Malaga is under 2 hours along the scenic coastal motorway. The house sits in four acres of wild land surrounded by pomegranate, fig and olive trees, it sleeps up to 8 people in shared bedrooms max 3 per room. It is paradise for nature lovers, ibex and wild boar roam the land and goatherds drive their flock close by. Eagles, eagrets, bee eaters, hoopo, swallows and golden oriole are amongst the many birds. There are several terraces and balconies, it's not hard to find a quiet spot outside to meditate or read. And if walking is your thing just set off up the mountain from the front door. If you would like to go further afield, to a mountain village, Granada or the beach, these are all easily accessible by car. The house is barely in Europe, closer in spirit to Africa with it's 320 average annual days of sun. There are good motorways in Spain if you are coming overland. As for train travel Granada is the closest rail station. And by air the closest airport is Malaga, served by many budget airlines. The house is a pleasant car journey of under 2 hours along the coastal motorway from there. Alternatively one may travel by coach either directly to Orgiva (limited service) or via Granada changing there for Orgiva (more frequent service). Taxi's from the airport are expensive, it may be possible to arrange a more economical pickup if booked in advance. The house is 6 Km from Orgiva and use of one car is essential for any visiting parties. The house is often available for private rental by parties of up to 6 in July and August and occasionally at other times. The house is not suitable for very young children. You will usually receive a reply within 24 hours.